In 2004, Pérez Bustamante & Ponce participated in the first-ever claim against Ecuador at ICSID, helping Repsol YPF to win US$13 million in a contractual claim. Remarkably, two of the firm’s partners oversaw the whole case, without any assistance from international co-counsel. Not long after, the firm – one of Ecuador’s oldest – began to attract many foreign oil and gas companies affected by regulatory changes introduced by Ecuador’s former president Rafael Correa. It often pairs up with firms such as Freshfields Bruckhaus Deringer, King & Spalding and White & Case on investment cases. Rodrigo Jijón, a founder and former president of the Ecuadorean Arbitration Institute, leads the international arbitration practice and is also well known for his energy law expertise. Alongside partner Juan Manuel Marchán, who is increasingly active on investment treaty matters, Jijón is active in the ICC’s Ecuadorian chapter and was a member of the commission in charge of drafting a reform to Ecuador’s Arbitration and Mediation Law. Energy clients feature prominently on the list. Perenco, ConocoPhillips, Murphy Oil, Noble Energy and Japan’s Teikoku Oil have all turned to the firm for investment claims against Ecuador, as has Brazilian state oil and gas company Petrobras. Chevron has also reportedly used the firm for local law advice in connection with its long-running dispute over environmental pollution in the Amazon rainforest – including in a denial of justice claim against Ecuador playing out before an arbitral tribunal in The Hague. It has defended Occidental Petroleum and BP in local environmental litigation (the BP case was linked to the Deepwater Horizon spill). Chinese construction companies CRBC, Hyrdrochina and China Railway have turned to the firm for advice in investment treaty and commercial arbitration proceedings. Other clients of note include Daimler Chrysler, Brazilian construction group Odebrecht, Spain’s Telefónica, Nestlé, Hong Kong’s CK Hutchison Holdings, Global Franchising Corporation, Australian infrastructure company Cardno and Spain’s Maessa. The firm partnered with Freshfields in UNCITRAL proceedings on behalf of Petrobras and its consortium partners in a claim against Ecuador concerning the nationalisation of two oil projects. The tribunal awarded the claimants US$515 million in early 2018. In 2017, the firm served as co-counsel with Haynes & Boone in ICDR proceedings on behalf of Global Franchising Group against a local franchisee in Ecuador, clinching a US$2 million award for its client. Alongside King & Spalding, the firm helped the US’s Murphy Oil win more than US$30 million in 2016 in an UNCITRAL claim against Ecuador over the state’s 99% levy on windfall oil profits. Pairing up with White & Case, the firm helped subsidiaries of Hong Kong conglomerate CK Hutchison Holdings knock out the bulk of a US$200 million claim brought by an Ecuadorean port authority in 2015. Another collaboration with White & Case saw the two firms help airport consortium Quiport settle a dispute with Ecuador in 2011 over the construction of an international airport in Quito; the claimants dropped their ICSID case after agreeing on new contractual terms. Going further back, it helped Noble Energy settle an ICSID claim against Ecuador in 2009, convincing the state to pay US$70 million to resolve the dispute. It has been working with Jones Day in a US$50 million dispute over a contract to build a liquefied petroleum gas site off the coast of Ecuador. The firm recently submitted a notification of controversy under the Ecuador-Netherlands BIT regarding expropriation of two tourist ships in the Galapagos. It is advising a Chinese construction company in a US$150 million dispute against an Ecuadorian electric company. It is also advising Telefónica in several arbitration proceedings against Ecuador’s telecoms authority. Specialization is one of the main values of PBP. The firm has an extensive group of specialists across 17 practice areas. Each practice works in coordination with other areas to provide high qual­ity, comprehensive and effective legal advice. PBP combines experience with dynamism. The team is comprised of several of the most reputa­ble and experienced lawyers in Ecuador who work together with talented younger members who excel in their practice areas. The team has both local and international experience. 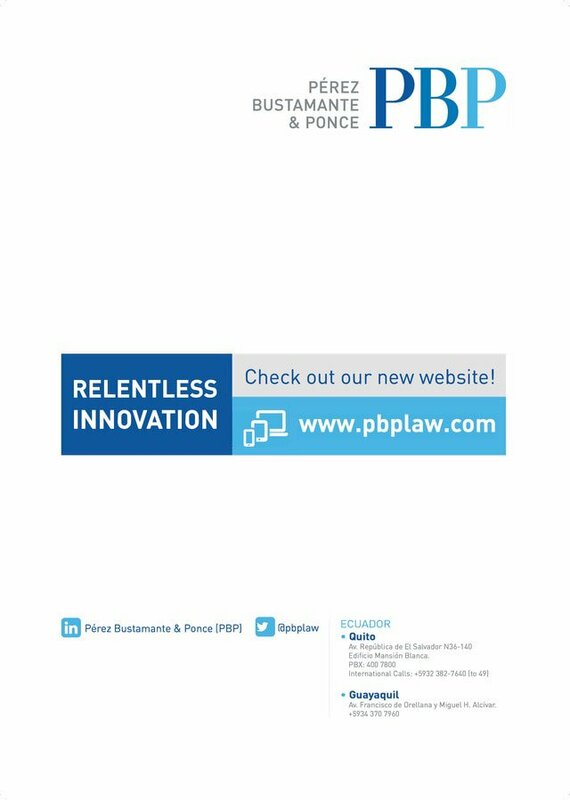 Many professionals at PBP have attended renowned local and international universities and have worked at first-rate law firms around the world and some of its attorneys have been admitted to practice in the state of New York, District of Columbia, Spain, Chile, Colombia and other jurisdictions. 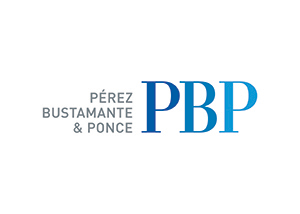 PBP has consistently been honoured as Ecuadorian Firm of the Year seven times by Chambers Latin America (2016, 2015, 2014, 2013, 2011, 2010, 2009) and six times by Who’s Who Legal (2016, 2014, 2013, 2012, 2011, 2010) The firm is the exclusive member for Ecuador of Lex Mundi, Interlaw and Club de Abogados – the most important international legal networks. International arbitrationis one of PBP main practice areas, including ICSID and ICC cases ranging from investment arbitration to commercial disputes. PBP is listed by GAR 100 as a leading firm in this field. The firm has been very active in the arbitration arena. It has recently represented MAESSA and SEMI (Consorcio GLP’s foreign investors) in an international investment-treaty arbitration brought under the Ecuador-Spain BIT, related to the unlawful termination of a construction contract; Teikoku Oil Ecuador and Cayman Exploration in an international arbitration under UNCITRAL Rules for the breach of the Oil Services Agreement executed with Ecuador (Petroecuador); Mexico’s largest soda bottling company in an ICC arbitration resulting from a Sales Purchase Agreement; subsidiaries of Hong Kong conglomerate CK Hutchison Holdings, knocking out the bulk of a US$200 million claim brought by an Ecuadorean port authority over their early termination of a port upgrade project (a split tribunal awarded just US$35 million in damages); Tuscany International Drilling in an arbitration against Consorcio CYA under the rules of the Quito Chamber of Commerce; Nestle Ecuador in an arbitration proceeding against Etinar S.A. brought under the rules and administration of the Quito Chamber of Commerce. The firm has also participated in an ICSID arbitration proceeding brought by Murphy Exploration and Production Company International against the government of Ecuador; two UNCITRAL proceedings brought by a multinational oil firm against the Republic of Ecuador; an ICC case against an Italian company with seat of arbitration in Ecuador; an ICSID arbitration proceeding by a multinational American oil company for breach of contract and violation of the US–Ecuador BIT; and an ICSID arbitration claim filed on behalf of a multinational oil firm against the Republic of Ecuador and the state-owned company Petroecuador, among others.